is the governing power of creative writing. Wonderful saying! A writer creates reality in his imagination, invites others into it, and others accept and follow him there! Well said, Subhan. This is so true! I think you’re right, but I think intelligence can add muscle where creativity sometimes is only bare bones. Many thanks Subhan for the kind words, I look forward to reading and following your blogs. As you must’ve noticed, I am not much of a creative writer. I write down based on my observation and imagination of things around me. SO I agree with your thoughts here Subhan. 🙂 Great work! Keep them coming! I mostly live in my imagination, so I love this! You are right! In creative writing, it does not matter what amount of knowledge you have, it is taking what you know and conveying it in a unique matter is what you should strive for! I love this quote from you and really wanted to think about it before I responded. So many people think that writing is a matter of formulizing a sentence, a paragraph, a book after a certain schema and then they have a best seller. That may happen but that is not creativity, in my opionion. Creativity takes place from the world that you have created within yourself. You build that world in your mind and from within you comes words that flow out into a book of literary dimension, whether it is poetry, non-fiction or fiction. You have quoted exactly what I think. It is not the intelligence of a person take gets the attention of the reader, it is the world they live in within their mind. An excellent quote, and one that I wanted to ponder over before saying something. Probably true. Look at Rudyard Kipling: not a great mind, but an intuitive writer. Hi Subhan, Creativity comes from God and so does real Truth, His Truth is the only Truth that will last, all others as you said have no solid foundation. Thanks for sharing that Truth! Thank you for dropping by and commenting, Anne. I hope you have a wonderful week ahead. That is so true. I’ve worked with Phd’s who were brilliant in their field but lacked imagination. Excellent. Without imagination, we have nothing … not great writing, music, advancements in space exploration, etc. i couldnt help but reblog this, Subhan! I need all the inspiration I can get! I am always blocked! 🙂 Your words are always great way to start my day! How true. 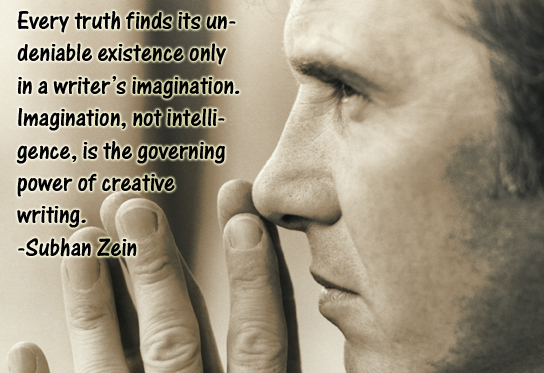 Creative writing comes from the spirit, from the imagination. It is a gift we uncover not one that we chase after. Very deep and meaningful thoughts Subhan, and so true. Thank you Subhan…this is a very wise saying.